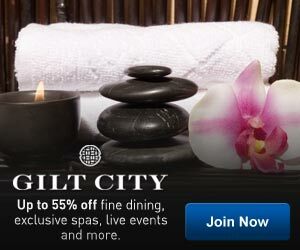 Gilt City | Sign Up Today for Local Deals! Home / Deals / Online Deals / Gilt City | Sign Up Today for Local Deals! Gilt is one of my favorite online Shopping Sites (Check it out here if you haven’t already joined) and right now they have a new site called Gilt City where you can get local deals every day! New members of Gilt City will get an extra 25% off of your first purchase. Gilt City offers upscale and high end offers for up to 55% off on restaurants, spas, fitness classes, beauty offers, shows local events. They will have new sales in your area up to 55% off every week. You’ve got to check all of these great deals out! They have pretty much everything you could want in your city at amazing prices. From Pilates classes to award winning restaurants, you’re going to save tons of money. They will also have some exclusive member-only events like FREE movie screenings. Join Gilt City today to check out all of their amazing deals! 10 ft. 8 Pin Noodle iPhone Charger Cable $4.99 with FREE Shipping! 8 Different Stacking Kohl’s Coupons Online + Kohl’s Cash!